Welcome to Rouen! 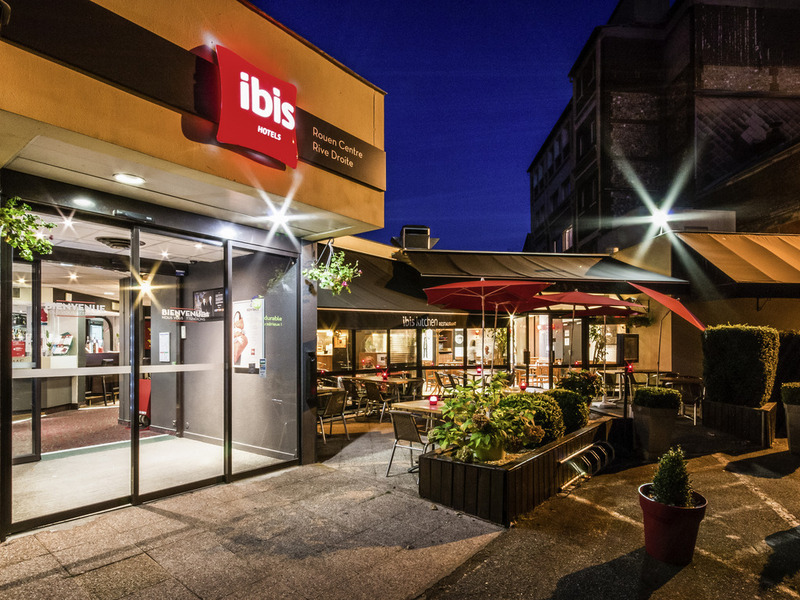 The entire team at the ibis Rouen Rive Droite is at your service to ensure your stay is a pleasant one. Make the most of our advice and discover Rouen in the heart of Normandy, with its rich history and cultural monuments. See you soon! The ibis Rouen Centre Rive Droite hotel is located a 10-min walk from the historic center and its cathedral, 984 yards from the Kindarena sports arena and opposite the dockland area of the Quais de Seine - perfect for a stroll or to discover the Panorama XXL center. The hotel offers air-conditioned rooms, a bar, restaurant with covered terrace, meeting room and private car park. The ibis Rouen Centre Rive Droite is the ideal place for your business trips or for discovering Rouen, the capital of Normandy. Close to the banks of the Seine and the dockland area, a 5-minute walk from Place du Vieux Marché and the main shopping streets, close to the municipal offices, a 10-minute walk from Flaubert Bridge and the Gros Horloge, and 10 minutes from the Kindarena. Restaurant and bar with outdoor terrace, gaming/business areas, electric bikes. High-speed WIFI, web corner, local and national newspapers, choice of ambient music. Opposite the banks of the Seine, dockland area and Panorama XXL and close to the Kindarena. Close to the historic center of Rouen, Notre Dame cathedral and the historic Norman district. The healthy choice. The simplicity of a buffet and traditional dishes that are easy to share. Хорошее месторасположение отела, удобная охраняемая парковка, тихо в номере. Номера не самые новые, ванная требует ремонта. Всё как и положено в стиле ибиса. Завтрак хороший, кофе, круассаны, не было только омлета.